I've been on this weight loss journey for 15 weeks now and am proud to say that I have lost 15.2 lbs. Knowing that it may take me more than a year to reach my goal weight is daunting. Sometimes it would be so much easier to just quit and move on. It is extremely hard to stay motivated and believe me, I take any little nugget of inspiration to keep me going. It is the most elementary of motivators. Yes, stickers. I use them in my efforts to potty train my toddler. I am using them in my efforts to lose weight. For those of you who are not familiar with WeightWatchers meetings, part of the meeting is spent doing some congratulatory cheering for those who have reached milestones in their journey. As you reach these milestones, everyone claps for you and you get, yes, a sticker. You get a sticker for every 5 lbs lost, 5%, 10% and of course reaching goal and lifetime status. I kid you not. I live for these stickers. For me, getting to the next 5 pounds is a huge deal because it is NOT EASY. For some reason, they missed giving me my props for the last two milestones. 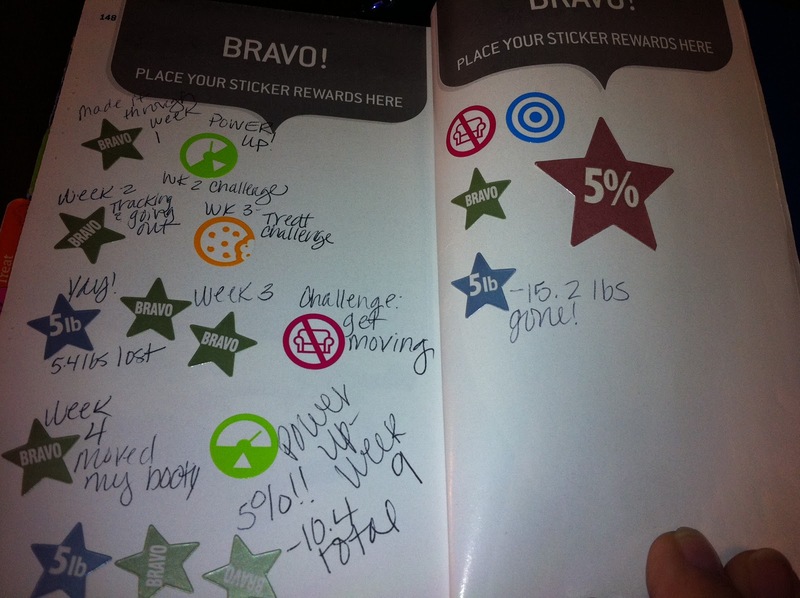 I reached my 5% quite some time ago and this week, reaching 15.2 lbs, I should've earned a second 5+ lbs sticker. They missed me. I was bummed. While I don't care about people clapping for me, I wanted my stickers! So, I approached the meeting leader and asked her for my stickers. I felt kind of stupid, but when I told her how much of a big deal it was for me to get these stickers in terms of my continuing motivation, she totally understood (at least, I think she did). I'm saving these stickers as a reminder of how far I've come already in this journey. 15.2 pounds is a big deal. Yes, I have a long way to go, but for NOW I want to celebrate where I am today. With my medical exercise restriction (just ONE MORE WEEK and I can get back on the pavement), I need to use these little nuggets of motivation to keep myself on the program. Don't let anyone take away those motivation nuggets- go and get them when you need them! Could I Be The Next Future PriorFatGirl Mom?